Main Street Art, Inc. has worked in the greater Art community for over 30 years. During this time we have developed the relationships and expertise in Sculpture and within the Art Community throughout the United States. 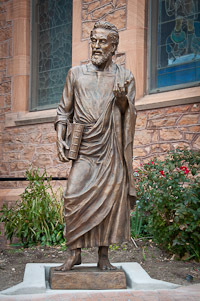 We also have expertise in the production and installation of monuments or life size sculptures. This includes the development for the proper outdoor patinas, pedestals, lighting and installation methods. With these relationships and technical abilities, we are in a key position to acquire and place existing sculptures to enhance your finished project. Since 1982, Main Street Arts’ founders and owners, Brian & Wendy Streadbeck, have supported and promoted the arts. Starting with Brian’s brother Steven, a master sculptor, the company expanded to include the promotion of the artwork of some of America’s best known and respected artists. Main Street Art has grown to be relied on as a source for artistic expertise in the area of Public, Corporate and Private Art collections. Throughout the years, Main Street Art has been commissioned with some nationally known and award winning projects. Some of these include: “Forever Remember”, commissioned by the Marietta Kiwanis Foundation Inc. “First to Fire”, commissioned by the U.S. Air Defense Artillery. “Governor Matheson” commissioned by the Utah Arts Council . “Mark Twain”, a private commission. And “Brigham Young” commissioned by the Utah Arts Council. The company has focused primarily on sculptures. During the history of Main Street Art, the company has placed literally hundreds of Sculptures throughout the US and a few throughout the World. Main Street Art Inc. has become an expert in selecting the proper artist or craftsman for each of the projects in which they are involved. They have developed expertise in Museum quality production, installation, maintenance, and restoration of current and historic work. have been trusted with some of the nation’s most important work. Brian’s technical expertise grew when he founded with his brothers, Steven and Gary, Adonis Bronze in 1989. 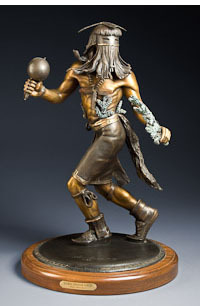 (Visit www.adonisbronze.com) Adonis Bronze has grown to become one of the nation’s largest and most respected bronze foundries, creating museum quality castings. Adonis is also recognized as experts in the restoration, and installations of monumental sculptures. Later Brian built with his brothers the Alpine Art Center, (visit www.alpineartcenter.com) the current home of Adonis Bronze and of the Sculpture Park Art Foundations’ 11 acre sculpture park.